As everyone should know, 4drn is a huge fan of piggies. Once, a few years ago, I gave her a little electronic pig for her birthday... we ended up naming it Toasty. 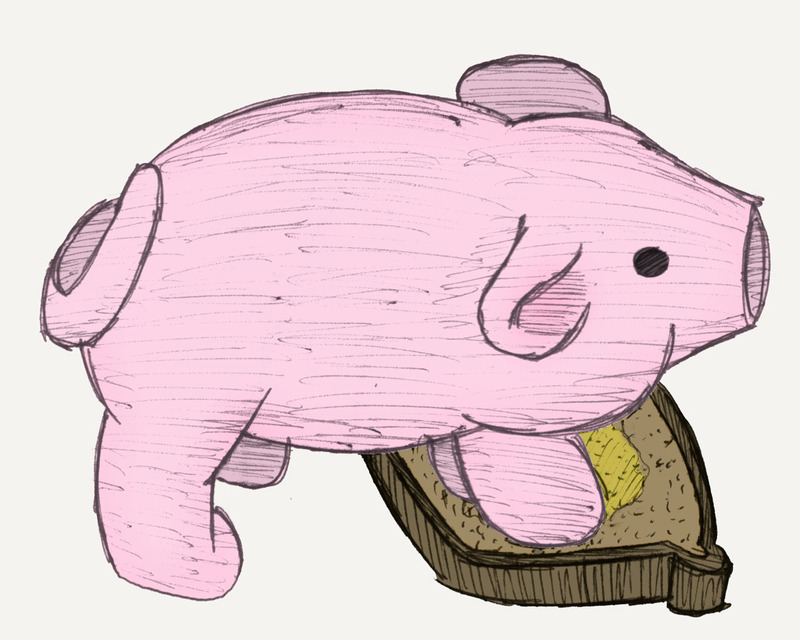 Much later, when 4drn was feeling pretty stressed, I sat down and sketched the above linework of Toasty on, well, a piece of toast. Finally, recently 4drn has been mad stressed, so here's a colored version of the sketch, I hope you like it. Notes of interest... I'm playing around with the opacities of my colors, to try and make the linework blend a bit more. I obviously need to work on my method, but I kind like the colored and shaded lines. As I have done before, I'm going with extremely soft shading, not enough to be notable, but maybe making the piece smoother and easier on the eye. Last but not least, it is 1280x1024 if anyone wants a new background.